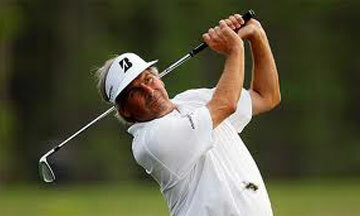 Fred Couples is unquestionably one of the most admired American golfers, cherished by fans the world over. His reputation and demeanour is one of a calm, highly talented and affable guy, and as a result he occupies a place within the highest echelons of the game in the minds of both his contemporaries and his fans. His career has not been built solely on popularity though; Couples has an enviable record as a professional golfer: 15 PGA Tour Titles (including The Players Championships in 1984 and 1996); 2 European Tour Titles; 4 Champions Tour Titles in his debut season (2010); and 30 other professional wins. He played in the Ryder Cup on five occasions from 1989 – 1997 and also held the World Number One spot in the Official Golf World Rankings in 1992. 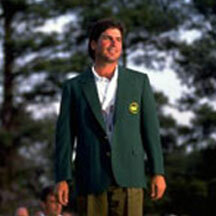 The pinnacle of Fred Couples’ career is undoubtedly his win at the 1992 Masters. Despite three consecutive rounds in the 60s that are worthy of winning any Major, his victory is best remembered for the enormous slice of luck he enjoyed on the last day at the short 12th hole. They say you need a bit of luck to win a Major and he certainly got his! His shot into the par 3 seemed destined to roll back into Rae’s Creek but miraculously defied gravity at the last minute. Rolling agonisingly back into the water the ball instead clung on to the final inches of the closely-shaven river bank and Freddy took full advantage, getting up and down for par en route to a closing back nine of one under par. That was enough to ensure he captured his first Major title in a manner that earned a place in the hearts of golf fans forever. In recent years there’s been some debate regarding the merits of former champions taking up the limited spaces at Augusta. The truth is, that was always the intention of the Masters – it was an invitational and a roll-call of previous champions vying for the title with the hot shots of the day. Who knows whether or not Bobby Jones and Clifford Roberts anticipated septuagenarians and the hopelessly-out-of-form continuing to accept their invitations but that is still part of the charm of the event and Couples is one of the older order whose performances have made a strong case for keeping this tradition alive. He holds the joint record (with Gary Player) for the number of consecutive cuts made, at 23. Not only that, but he came close to winning The Masters for a second time in 2010 finishing just shy of the winning post in 6thplace. Never there to bask in past glories; Couples undoubtedly deserves the invitation afforded to past champions and is likely to feature in future years. Part of the affection he enjoys from British fans in particular is courtesy of his laid-back attitude and apparent enjoyment playing golf on our shores. He has twice come close to winning The Open, with 3rd place finishes at Royal Birkdale and St. Andrews. He’s also had to deal with a back injury throughout his career which indeed sidelined him for virtually the entire 2007 season, making his performances since all the more remarkable. But for me and no doubt countless others, what marks Freddy apart from the rest is that effortless golf swing. It’s poetry in motion. Languid, uncomplicated and rhythmical, he flushes the golf ball with such graceful power and finesse that his action is the envy of just about every golfer on the planet. Even now, on the Champions Tour and in the autumn of his career, Fred’s swing stands in marked and refreshing contrast to the coached and mechanical style of many of the new breed. “Boom Boom”! Freddy is still the man!